Northern NY. Regional agribusinesses are the latest beneficiaries of the nearly 30 years of research dedicated by the farmer-driven Northern New York Agricultural Development Program to finding a solution to alfalfa snout beetle, an invasive insect that threatens alfalfa crops highly valued by dairy and livestock producers. Through the scientific discovery process, Cornell University entomologist Elson Shields and research support specialist Antonio Testa discovered native New York nematodes as a naturally occurring biological control for alfalfa snout beetle, ASB, and pioneered the use of the insect-attacking, microscopic worms to reduce beetle populations to manageable levels. The two scientists also developed a farmer-friendly, low-labor nematode rearing and application methods for farm-built and commercial sprayer units. With training from Shields and Testa, regional crop service agribusinesses are filling an economic gap by offering custom rearing and application of the nematodes between planting and harvesting seasons. One spray service in the northern NY is developing its own nematode rearing facility for use in 2016. In 2015, cost-sharing offered by the Northern New York Agricultural Development Program helped farmers to apply the nematodes on their own or with assistance from Cornell Cooperative Extension personnel or to hire a commercial applicator. Shields reports that 14 farms applied the biocontrol nematodes for the first time, treating 986 acres by participating in NNYADP cost-sharing to hire commercial applicators. A total of 4300 acres received nematodes in 2015. ‘We estimate a total of nearly 14,000 acres of alfalfa have been inoculated with the biocontrol nematodes in northern New York since 2007 when the first field application plots were established. With a large acreage of alfalfa grown in the known ASB infested area, a significant acreage remains in need of protection to help bring this insect under widespread management,’ Shields comments. Native to northern New York, the nematodes are adapted to persist and spread under regional conditions for many years, making one application to a field sufficient to prompt crop protection. 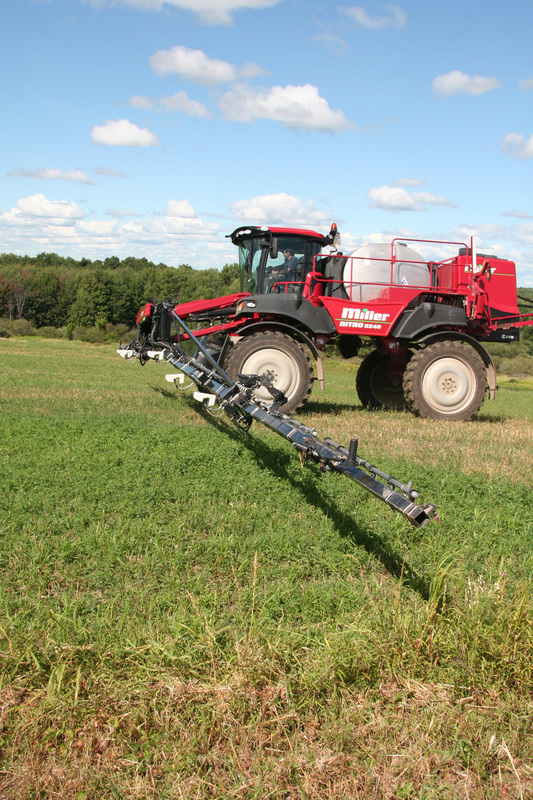 ‘When I heard Dr. Shields detail how the nematodes are helping to protect and restore alfalfa production, I saw the opportunity to protect farmer yields and investments with this service,’ says Aaron Miller of Miller’s Spray Service, Lowville, NY. Miller has offered nematode applications for the past four years. ‘The cost-sharing offered by the Northern New York Agricultural Development Program in 2015 helped prompt farmers who would never think of applying the nematodes previously. With milk pricing challenging, the cost sharing offered them the chance to take advantage of the biocontrol by using our service,’ Miller says. The nematodes must be applied on cloudy days or late in the day when they are less exposed to the UV light that is fatal to them. The nematodes also need time to enter the soil after surface application. ‘Our alfalfa acres represent half of our dairy diet. With snout beetle problems for years, we never could keep a stand of alfalfa before we started participating in the research trials. Now one application of the nematodes looks to have good results long term so we continue to apply them,’ says Doug Moser of Moserdale Farm, Copenhagen, NY. As a critical component of the dairy cow diet, alfalfa is estimated at a value of $135 per ton of dry matter for milk production. Lynn Murray of Murcrest Farm, Copenhagen, NY, began applications in earnest five years ago. ‘The outlook had become pretty bleak; our alfalfa seedings were half gone by the third year with none left by the fourth. The Northern New York Agricultural Development Program snout beetle project has paid dividends here. My 2015 alfalfa crop produced the best first cutting yield ever, and, with the nematode applications, we now have two fields producing more than 60 percent alfalfa into their sixth year,’ Murray says. Mary DeBeer, a partner with her father Ronald in DeBeer Seeds and Spraying, Moira, NY, learned how to rear and apply nematodes in a workshop with Tony Testa. In 2014 Norco Farms, Hopkinton, provided them the proper environment to raise nematodes for application to 125 acres in Franklin County. In 2015, they applied nematodes to 435 acres located across six farms. ‘The Northern New York Agricultural Development Program research and training on this biocontrol has been very good for helping us cope with snout beetle as an increasing problem in the Malone area. Applying the nematodes is an added value service we can offer to help our farmers produce better alfalfa crops. I believe a lot of farmers do not have the time to make the applications on their own,’ Mary says. With technical assistance from the Shields Lab at Cornell University, the DeBeers plan to establish their own nematode rearing lab in 2016. Other services that offered the biocontrol nematode application service in 2015 are Rudd Spray Service, Watertown, NY; and D and D Spray Service, Adams, NY. To determine the current range of the alfalfa snout beetle, the Northern New York Agricultural Development Program is funding the updating of the ASB range map first developed eight years ago. Growers and Cornell Cooperative Extension Field Crops Specialists are scouting in Clinton, Essex, Franklin, Jefferson, Lewis and St. Lawrence counties. The pest also exists in three other counties in New York State and in southeastern Ontario, Canada. ‘Every year we find new infestations. If a neighboring farm has snout beetle, there is a high likelihood that ASB is present in your alfalfa,’ says Kitty O’Neil, CCE NNY Regional Field Crops and Soils Specialist with St. Lawrence, Franklin, Clinton and Essex counties. ‘The decline in the alfalfa stands is often blamed on winterkill, aggressive cutting or the alfalfa variety, when, in fact, it is alfalfa snout beetle. Growers may only notice that the stand is thinner each year,’ says Michael E. Hunter, a NNY Field Crop Specialist with Cornell Cooperative Extension in Jefferson and Lewis counties. For assistance in evaluating fields for alfalfa snout beetle, Hunter can be reached at 315.788.8450, meh27@cornell.edu; O’Neil can be reached at 315.379.9192, kao32@cornell.edu. NNYADP reports on alfalfa snout beetle research and other projects are found online at nnyagdev.org. The Northern New York Agricultural Development Program is a farmer-driven research and technical assistance program for Clinton, Essex, Franklin, Jefferson, Lewis and St. Lawrence counties. Funding for the Northern New York Agricultural Development Program is supported by the New York State Senate and administered through the New York State Department of Agriculture and Markets.